It's really funny that I've never heard myself say that I favor a black and white color palette and if anyone ever told me that it seemed like one of my favorites, I would've responded with a "really??" But apparently I've been quietly oblivious to my own styling activities, despite the fact that my dining room, kitchen and upstairs hall are all punctuated or completely centered on black and white. And recently I've found myself reaching for bold black and white more often than usual (like here and here), often punctuating with pops of color, like today. This dress is more of an ivory and black than starch white, but the bold structured lines offer the same crisp clean feel. 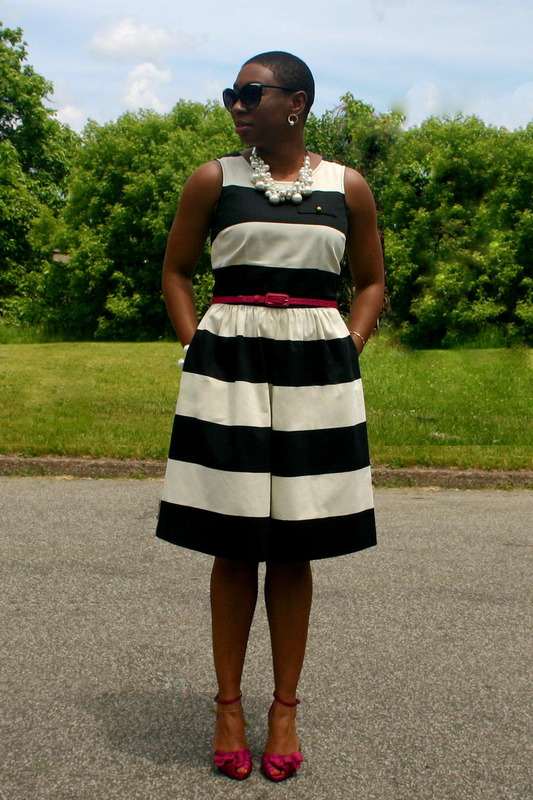 I really love the classic whimsy that stripes offer, but they can sometimes be dangerous. 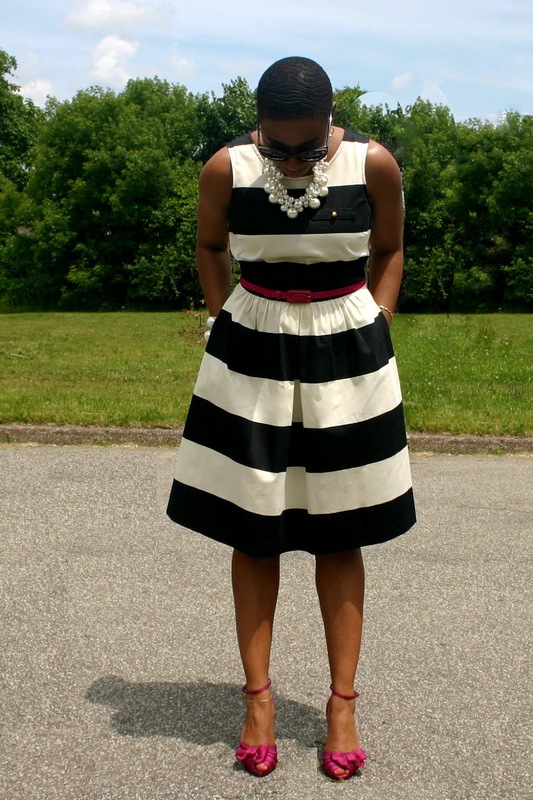 Vertical stripes especially, if not properly proportioned they can over accentuate areas like busts, hips and bellies. Along with the stripe spacing and sizing, the cut of the dress or top can make all the difference. There are no hard and fast rules, just make sure you wear what you love and that it's not wearing you! Because I like to conceal the areas of my body that I don't love as much, I am typically drawn to dresses that are flowy or, like this one, have a feminine A-line shape. Adding a colorful belt allows me to still highlight my waistline. 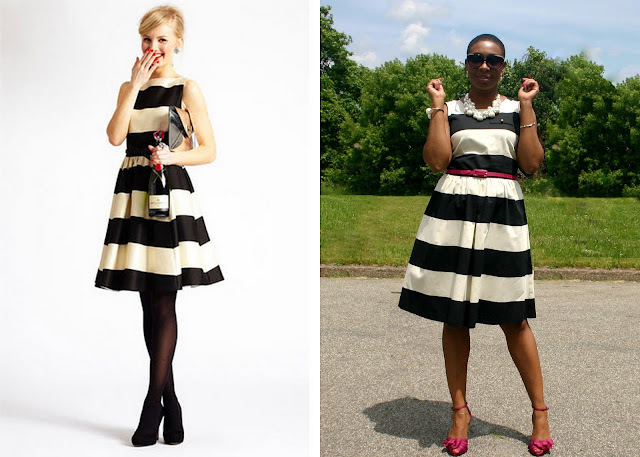 I have a unwavering love for Kate Spade (as I expressed in Monday's easy, peasy DIY post) so I was delighted to find that my dress was likely inspired by one of Kate's lovely dresses....and I ain't mad at that! Both of these dresses are from previous seasons, so they aren't available, but if you like the look this is a super similar style and here are a few other cute options that are similar, found here, here, here and here!